Police in kiambu are holding a 32-year old man who has allegedly been sexually assulting his three children. Joseph Maina is said to have committed the heinous act on his two daughters and a son aged between one and three years for some time now.he seven year old girl opened up to the mother after she developed complications and could not take it any more.The five year old boy had earlier told the mother of how, their father would take them to another woman who is alleged to be his girlfriend who abused him sexually in the full view of his father who would also take turns with his sisters.e in kiambu are holding a 32-year old man who has allegedly been sexually assulting his three children. Joseph Maina is said to have committed the heinous act on his two daughters and a son aged between one and three years for some time now.he seven year old girl opened up to the mother after she developed complications and could not take it any more.The five year old boy had earlier told the mother of how, their father would take them to another woman who is alleged to be his girlfriend who abused him sexually in the full view of his father who would also take t sisters. The kids are traumatized ...I wish you could hear the young one recounting what his father does everyday...it's too painful to comprehend....this sick man threatened to kill his wife if she ever told anyone...Women ,parents teach your children to say to tell,to shout,and yell Against molesters! Margaret Obura is angry and at the verge of dispair one month after her daughter died in Dubai mysteriously. saying her family was taken round and round by the ministry officials who never wanted to mention the disease their daughter suffered from. And finally after a week the Ministry of Foreign Affairs said she died from AIDS. Speaking to k24 on phone Kamau Wamunyu a Ministry of Foreign Affairs official however says the body may be allowed in Kenya once the Ministry lodge an appeal for exception from the Dubail Public Health Act that prohibits ferrying of such bodys. why can't Kenyan government put their own foot down? what is so hard the children are asking just to see their mother's dead body say good bye! arents are termed as their own biggest enemy when it comes to issues of protecting their children against child abuse. According to the program manager for The Cradle, Brian Weke, modernisation and the cliche' of hard economic times has changed parents to money minting machines, completely abdicating their roles in bringing up their children. WE ARE ONE lets end FGM torture..dance to the song..
WE ARE ALL ONE....every weekend I see my refugees familes during home visits and reunion where we normally dance to this song and sing it...crying tears of joy..when we narrate to each other our past experiences and how we made it...SOME STORIES ARE JUST AMAZING,,, WORKING ON PUTTING A DOCUMENTARY AND ALSO FEATURE SOME OF EXPERIENCES IN MY BOOK-- I LOVE MYCALLING...WE ARE JUST GREATFUL AND EVERYDAY IS A HUGE BLESSING TO US. 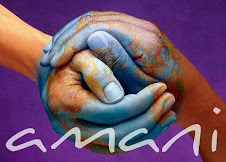 YES WE ARE ALL ONE...PRAISE GOD- GOD BLESS HUMANITY WE ARE ONE. MY PEOPLE AGAINST FGM.....SAD TO SEE ONLY ONE MUTILATOR ABANDONED THE CRUELITY. ..THAT IS A STEP...FGM IS 98% IN MY MAASAI COMMUNITY...I PRAY TO GOD DAY AND NIGHT THAT MY PPLE WILL OPEN THEIR EYES...I WILL CONTINUE TO CAMPAIGN...AM WORKING ON MY BOOK FEATURING MY FIGHT AGAINST FGM WHICH LED TO MY SEPERATION WITH MY CHILDREN, MY FAMILY....THE PRICE I HAD TO PAY AND STILL PAY DEARLY....TAKING THE HIGH ROAD TO ERADICATE FGM...UKEKETAJI NI UNYANYASAJI WA HAKI ZETU NA KUMKOSOA MUNGU .....TENA NI DHAMBI!